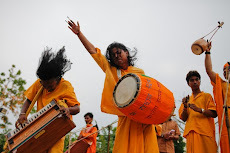 Shantiniketan, 28 February : Violence and boycott marked the “Basanta Utsav” (Spring Festival) on the Vishva-Bharati campus at Santiniketan on Sunday. 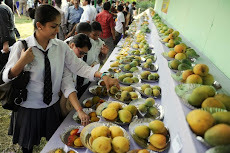 The tradition of celebrating Basanta Utsav at Santiniketan was started by Nobel laureate Rabindranath Tagore himself and it is one of the two occasions that draws thousands to the university to witness and participate in the colourful festivities, including several cultural functions. 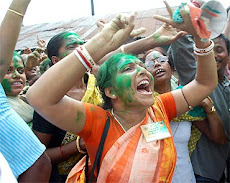 In other parts of West Bengal, Tripura, Bangladesh, Assam, Andamans...thousands of people celebrated Holi or Basanta Utsav (spring festival) with songs, dance and other cultural programmes. 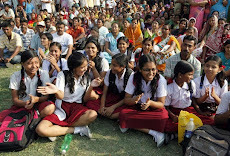 In Shantiniketan, some students and teachers of Visva Bharati University took out rallies within the campus celebrating the festive fervour and danced to the tunes of Tagore's songs. 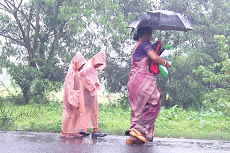 Many people were seen smearing colour (abir) on each other and exchanging sweets and pleasantries to mark the festival of Basanta Utsav. 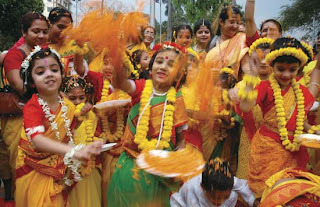 Tagore had reintroduced Holi as Basanta Utsav in the Visva Bharati University he founded in Birbhum district's Shantiniketan. Thousands of tourists from within the country and abroad also thronged Shantiniketan Sunday to soak in the colours of Basanta Utsav. (L) Villagers having a look on a dead elephant which was knocked down by a train in Deepor Beel Wildlife Sanctuary in the outskirts of Guwahati city on Sunday. Two elephants were knocked down by a train as a group of wild Asiatic Elephant came down to the sanctuary in search of food. One female elephant was killed and the other pregnant elephant was seriously injured in this tragic incident. The pregnant elephant is later given birth a baby elephant in the incident site. (R) A bulldozer carry a dead elephant which was knocked down by a train in Deepor Beel Wildlife Sanctuary in the outskirts of Guwahati city. 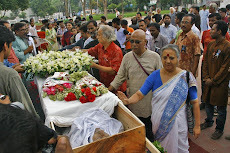 Kolkata, 28 February : Noted Bengali theatre personality Kumar Roy died at a city hospital early Sunday, his family said. He was 84. 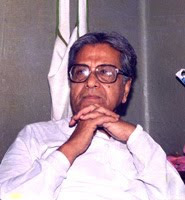 Born in 1926 in Dinajpur (now in Bangladesh), Roy was associated with popular Bengali theatre group Bohurupee. 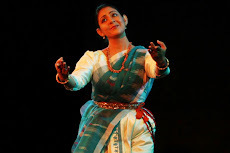 He was also the president of the Bengali theatre academy. 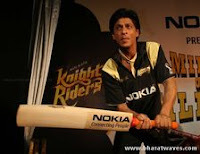 "He was suffering from cardiac enlargement and lung problem. He was admitted to R.G. Kar Hospital Feb 18 with some respiratory trouble. 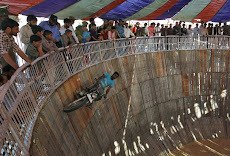 He died at 4.15am today (Sunday)," Indrapramit Roy, son of Kumar Roy, told reporters. He said Roy had donated his body to R.G. Kar hospital for the purpose of medical research. 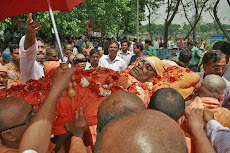 "The mortal remains of my father will be handed over to the hospital authorities tomorrow (Monday)," he said. 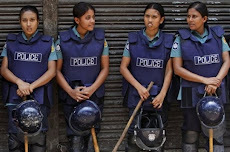 Dhaka, 28 February : The Rapid Action Battalion arrested a Pakistani national and four locals for suspected links to Pakistan-based militant group Jaish-e-Mohammed (JeM) in the city early Sunday. 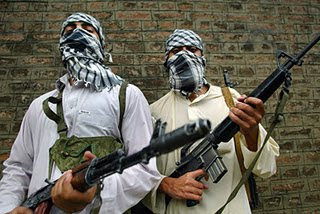 The Pakistani, Rezwan Ahmed, had been coordinating JeM operations in Bangladesh, said RAB officials. 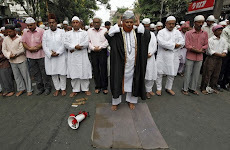 The other arrestees Nannu Mian alias Belal Mandol alias Billal, Abu Naser Munshi, Imad Uddin alias Munna, and Sadeque Hossain alias Khoka are his local associates. 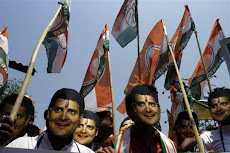 Of the five, Billal was arrested near the foot-bridge in front of New Market and the rest including Rezwan were rounded up in Sukanya Tower, an apartment block adjacent to Gausia Market on Mirpur Road. 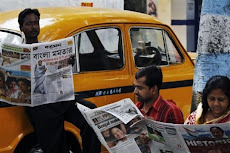 PTI, Bhubaneswar, 28 February : Five persons, including four tourists of a family from Howrah, were killed and another critically injured when the autorickshaw in which they were travelling collided with a truck on Puri-Bhubaneswar national highway, police said today. The incident occurred at Dahisapatana under Pipli police station late last night when they were going to Puri in the autorickshaw, the police said. The victims included an aged couple, their son and 6-year-old grand daughter and the driver. 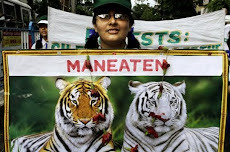 Kolkata, 28 February : For an authentic scientific study of their behaviour, tigers in the Sunderbans, the world's only mangrove eco-system which has big cats, will be fitted with radio collars, forest officials said. 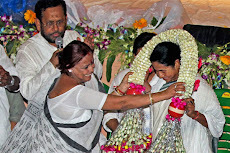 "Last week a tigress which had strayed into Gosaba area in South 24 Parganas district was fitted with a radio collar. We have to radio collar a few more tigers which will provide information about their behaviour in Sunderbans," Sunderban Biosphere Reserve (SBR) director Pradeep Vyas told a news agency. 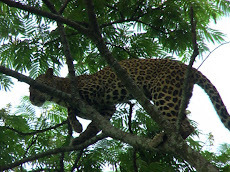 There was no scientific study on the behaviour of the big cats in the Sunderbans and all information was based solely on observation, he said. "So, an authentic scientific study is needed and radio collars will provide us exact information about the behaviour of tigers," Vyas said. It was found that it was the same tigress which had entered the locality for a second time in the past six months. Experts from the Wildlife Institute of India had last week fitted the tigress with a radio collar after it was tranquilised. Vyas said as per signals received from the radio collar, the tigress was roaming within a three-km area at Chorkhali in Netidhopani where it was released. After every incident of tiger straying into villages, questions were raised from different quarters, including wildlife NGOs, about the lack of prey base in the mangrove forest. 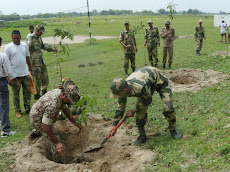 The West Bengal forest department has procured an imported radio collar at a cost of over Rs three lakh from the Dehra Dun-based Wildlife Institute of India. 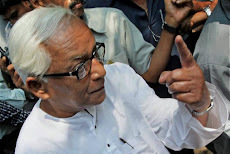 Shilda, 26 February : West Bengal governor, MK Narayanan has denied having given any advice to the state government on Operation Green Hunt, though he has said that he talked to chief minister Buddhadeb Bhattacharjee as the 15 February Maoist attack on the Eastern Frontier Rifles camp at Shilda. “I have my own views on Operation Green Hunt. I have not given any advice to the state government. 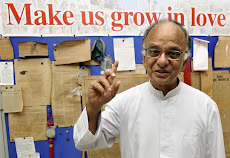 Yes, I had discussions with the chief minister (after the attack),” Narayanan, former National Security Adviser, was quoted as saying while talking to reporters after a visit to the EFR’s 3rd battalion headquarters. 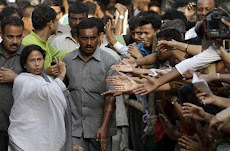 Kolkata, 26 February : Two days after Mamata Banerjee showered goodies on West Bengal in the railway budget, Finance Minister Pranab Mukherjee brought more cheer for the people of West Bengal. 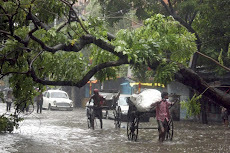 Mukherjee's proposal to include embankment schemes along rivers Bhagirathi and Ganga-Padma in the Central Sponsored Flood Management Programme, is good news for people in a vast stretch of north Bengal, where river erosion is a major problem. 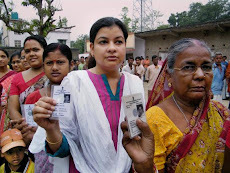 In the process, Mukherjee also served his constituency Jangipur in Murshidabad district, which is hard hit by the erosion. 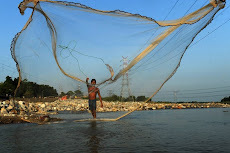 The Ganges-Padma erosion has impacted the lives of thousands in Murshidabad, with many of them displaced due to tides, especially between Farakka and Jalangi and from Jangipur to Sagardighi area. 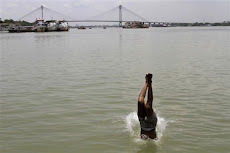 While mentioning the 'Mission Clean Ganga 2020' under the National Ganga River Basin Authority (NGRBA) with the objective that no untreated municipal sewage or industrial effluent will be discharged into the national river, Mukherjee said in his budget speech: "I propose to double the allocation for NGRBA in 2010-11 to Rs.500 crore." 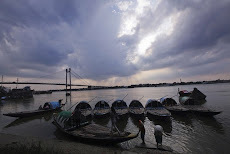 He added: "I am happy to inform the honourable members that schemes on bank protection works along river Bhagirathi and river Ganga-Padma in parts of Murshidabad and Nadia district of West Bengal have been included in the Centrally Sponsored Flood Management Programme. 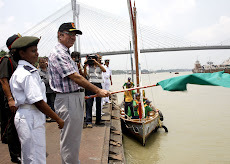 Mukherjee also provided budgetary support for drainage schemes of river-basins in East Midnapore and West Midnapore districts besides for the flood master plan on Kandi in Murshidabad district. 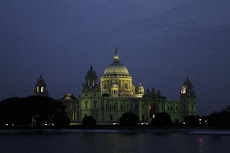 "I also propose to provide budgetary support for drainage scheme of Kaliaghai-Kapaleswari Baghai basin in the district of Purba and Paschim Midnapore, and Master Plan of Kandi sub-division in Murshidabad, West Bengal," the finance minister said. 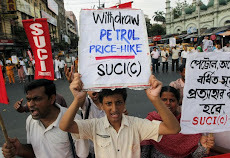 IANS, New Delhi, 26 February : Fuel prices in the country are set to increase with Finance Minister Pranab Mukherjee on Friday announcing restoration of basic duty on petrol, diesel and crude petroleum and a rise of Re 1 in central excise duty. 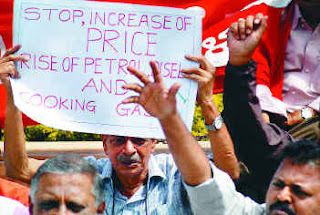 In his Budget speech 2010-11, Mukherjee said the government had exempted fuel from basic customs duty to give relief to the oil marketing companies. The global oil prices rose alarmingly to $112 per barrel last year. But, with global prices comparatively low right now, the government has taken the step to improve the fiscal position by restoring basic duty and increasing excise duty. UNB, Dhaka, 26 February : Bangladesh Prime Minister Sheikh Hasina expressed profound shock at the death of 21 garments workers died from suffocation in a fire at a garment factory in Gazipur Thursday night. In a message, the prime minister conveyed sympathy to the bereaved family members and prayed for the salvation of the departed souls. She also asked the concerned authorities to remain cautious so that this kind of incident doesn’t occur in future. 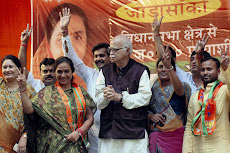 Purulia, 26 February : West Bengal Chief Minister Buddhedeb Bhattacharjee today distributed 'pattas' (land rights) of forest land to 513 tribals at a function here in Purulia district. 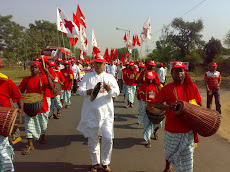 The chief minister said the 'pattas' were distributed in keeping with a Bill passed in Parliament in 2006 which recognised the rights of tribals over forest land which they have been occupying for generations. 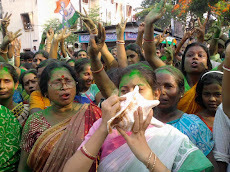 Bhattacharjee will leave for Bankura tomorrow. ANI, Jalpaiguri, 26 February : Wildlife authorities here are imparting special patrolling training to rescued elephant calves at the Jaldapara wildlife sanctuary in West Bengal's Jalpaiguri District. 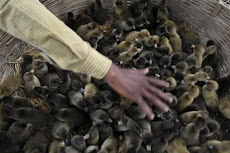 Buddhadeb Mondal, a forest ranger at the sanctuary, said six calves, ranging from three to four days to a year, are being trained. "We have already rescued six elephant cubs and their age varies from 3-4 days old to 1 year old. Some experienced Mahouts (elephant riders) are giving training to these cubs so that we can use these cubs when they grow up for patrolling purposes," said Mondal. Ravi Biswasarma, a mahout, said, "These elephant calves are fed by us, and when they grow up, they will patrol the forest." According to forest sources, there are 17 captive elephants at the rehabilitation center. 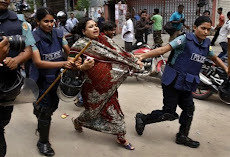 Dhaka, 26 February : At least 21 people, including 15 women, were killed and 50 injured in a major fire which broke out in a garment factory in Bangladesh's Gazipur town, around 50 km north of Dhaka, police said Friday. The blaze engulfed the Garib & Garib Sweater factory at around 9:30pm (BDST). Thursday when workers were preparing to leave, said Suman, one of the workers who escaped the fire. At least 50 were injured, suffering burns or smoke inhalation. 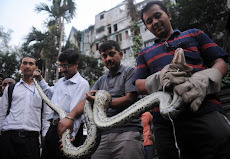 Of them, 20-25 were taken to hospitals, a senior police officer said. Gazipur General Hospital's Md Ataul Islam said, "Around 20 people were brought in, of which 11 were pronounced dead". 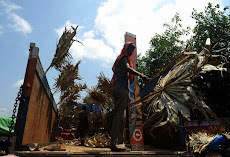 While seven workers were declared dead at Tongi government hospital, three deaths were confirmed by doctors at Tairunnessa Memorial Medical College and Hospital. The fire started on the first floor of the seven-storey building. Several workers were stuck on the second floor as the fire spread and firemen had to cut the window grills to rescue them. The cause of fire and total number of workers present in the building at that time was yet to be ascertained. 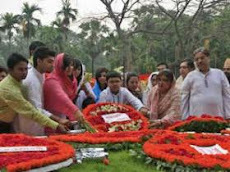 UNB, Dhaka, 25 February : Wreaths were placed on behalf of President Zillur Rahman and Prime Minister Sheikh Hasina at a memorial at the Banani army graveyard Thursday morning to show respect to the martyred army officers killed during the BDR mutiny last year. On this day, 57 brilliant army officers, who were deputed to the paramilitary Bangladesh Rifles as commanders, were killed by rebel BDR jawans at the Bangladesh Rifles headquarters at Pilkhana on 25-26 February, 2009. Of the 57 martyred army officers, 48 were buried at the Banani army graveyard. Assistant Military Secretary to the President Lt Col Zakir Hossain and Military Secretary to the Prime Minister Brig Gen Salahuddin Miaji placed the wreaths. 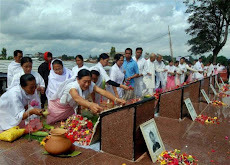 Home Minister Sahara Khatun, State Minister for Home Shamsul Huq Tuku and chiefs of the 3 services also placed wreaths at the memorial, observed one-minute silence. 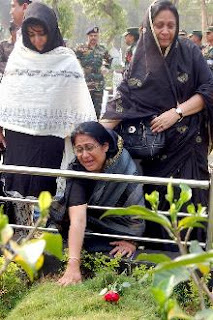 Family members of the martyred army officers also visited the graveyard. PTI, Guwahati, 25 February : ULFA 'publicity secretary' Mithinga Daimary, who was released from jail today after getting bail by the TADA court on 23 February, said peace talks cannot take place with the group's top leaders in jail. 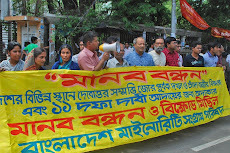 "All our top leaders, including 'chairman' Arabinda Rajkhowa, are in jail and it is not possible to hold talks unless they are released," Daimary told reporters outside Guwahati Central Jail. He hoped the government realises the hopes and aspirations of the people of Assam and do not delay the release of "our leaders so that talks can be held at the earliest". GJM wants early tripartite talks on separate "Gorkhaland"
PTI, Kolkata, 25 February : The Gorkha Janmukti Morcha (GJM) today said it wants the next round of tripartite talks on the Gorkhaland issue to be held at the earliest. At the last tripartite meeting held in Darjeeling on 21 December, the GJM had sought that the next round of talks should be held within 45 days. 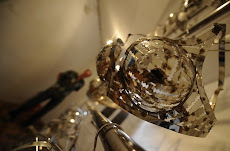 "Many days have elapsed since then. 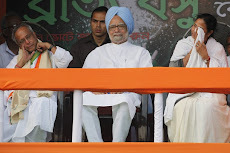 We want the Prime Minister (Manmohan Singh) and Union Home Minister (P Chidambaram) to see to it that the tripartite meeting at the political level be held without further delay," GJM general secretary Roshan Giri told PTI. 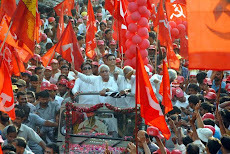 He charged the West Bengal government with trying to derail the talks by 'instigating' CPI(M) cadres to indulge in violence and blame the GJM for that. 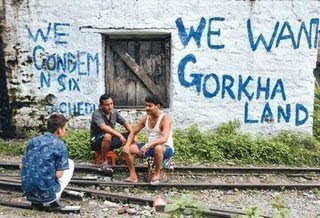 "The GJM is not indulging in violence like burning police stations. 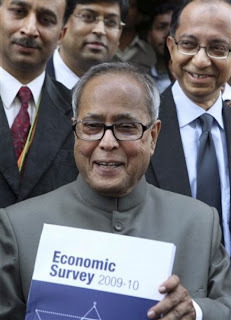 PTI, New Delhi, 25 February : Enthused by reforms and the strong fundamentals, the Economic Survey today predicted that India would bounce back to a high nine per cent growth in 2011-12 on the way to becoming world's fastest growing economy in four years. 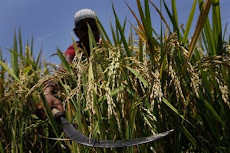 The document, which assesses the state of the economy, warned that high food prices would rise further over next few months and criticised the food management policies that have led to "unacceptably" high prices of items like sugar. 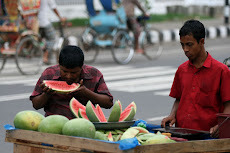 Food inflation is at present hovering close to 18 %. 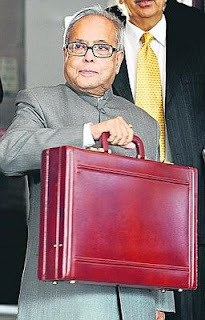 The pre-budget Survey (2009-10), presented by Finance Minister Pranab Mukherjee in Parliament, also recommended a "gradual rollback" of stimulus measures after assessing the impact on each sector. 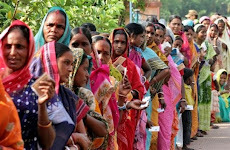 Bankura, 25 February : Blood continues to be spilt in West Bengal amid ceasefire offers and counteroffers by the Centre and Maoists. 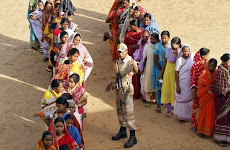 Rabilochan Mitra, Inspector-in-Charge of Sarenga Police Station in Bankura, was shot dead by Maoists on Wednesday night. 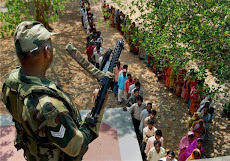 This is the first instance of a police officer of the rank of inspector being killed by Maoists in West Bengal after Centre-State combined forces were pressed into service in the state on 18 June, 2009. 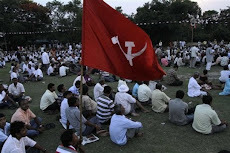 The clash ensued after Maoists attacked the residence of Tarashankar Patra, a local CPI(M) leader. Patra was shot in the leg. The Sarenga police station is close to Patra's residence. 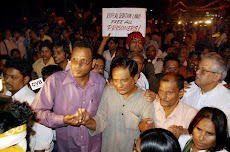 After getting a phone call about the attack Mitra reached Patra's residence and engaged the Maoists in a fight. 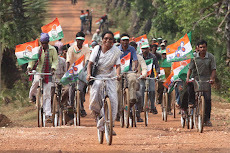 Initially, the Maoists retreated. But they retaliated and a bullet hit Mitra in his chest. 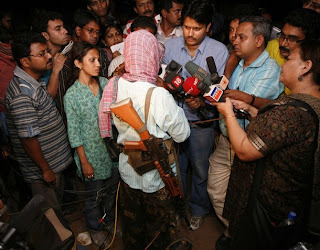 Police claim to have gunned down a Maoist called Jannath Duley. One Maoist is injured and has been admitted to the hospital. 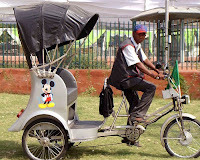 Durgapur, New Delhi, 25 February : At least 1,000 Durgapur's CMERI made solar rickshaws will be deployed to ferry over 7,000 athletes and their delegates during the Commonwealth Games later this year. A joint project between Delhi government and the central government-run Council of Scientific and Industrial Research (CSIR), these zero carbon vehicles will help players commute inside the Games villages and reach sporting venues from Metro stations. 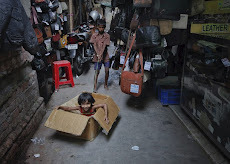 'Its a unique initiative, where both innovation and concern for environment will be on display,' Rajesh Kumar, a senior scientist at CSIR, told Bengal Newz. 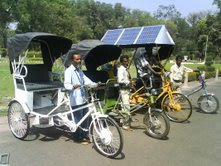 These vehicles were developed by CSIR's Central Mechanical Engineering Research Institute based in Durgapur. PTI, New Delhi, 25 February : Indian government today invited applications from mobile operators to participate in the auction of 3G spectrum and allowed three private players in most of the circles while four in five states including Punjab and Bihar. According to the Notice Inviting Applications (NIA) for 3G spectrum auction in 22 circles, most of the circles including four metros - Delhi, Mumbai, Kolkata and Chennai - would have three private players. Only five states of Punjab, West Bengal, Bihar, Himachal Pradesh and Jammu and Kashmir would accommodate four private operators. Rangamati, 25 February : Parbatya Bangalee Chhatra Parishad on Thursday enforced a daylong road and waterway blockade programme in Rangamati and Khagrachhari districts in protest against the attack on Bangalee settlers by a section of indigenous people. Clashes and arson attacks left at least three people dead in Khagrachhari and Rangamati districts in six-day violence following a land dispute between Bangalee settlers and indigenous people. Meanwhile, joint forces members in a raid arrested seven more people - 4 indigenous and 3 Bangalee settlers - from Khagrachhari district town and its adjacent areas from Wednesday evening to early Thursday in connection with Tuesday’s violence that left a Bangalee settler dead. 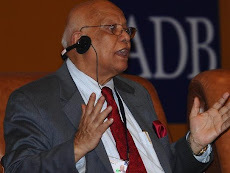 BBS, Dhaka, 25 February : President Zillur Rahman was admitted to the Mount Elizabeth Hospital in Singapore for his medical checkup Thursday morning. The president, who left Dhaka Wednesday night, arrived in Singapore at about 6:00am by a regular Singapore Airlines flight, a message received from Singapore said. Singapore High Commissioner to Bangladesh Verghese Mathews and Bangladesh High Commissioner to Singapore Kamrul Ahsan received the president at Singapore international airport. 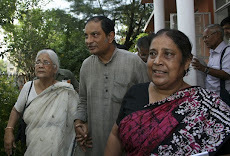 Family members and high officials at Bangabhaban including his personal physician are accompanying him. 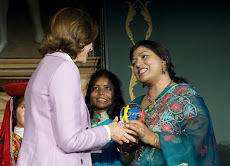 President Zillur Rahman is expected to return home on 4 March. 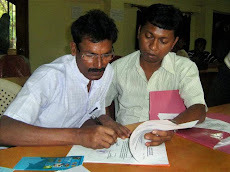 In April last year, Zillur Rahman underwent medical check up at the same hospital. 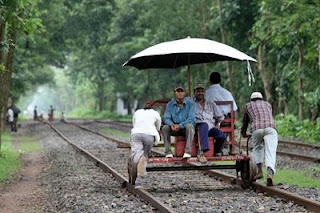 Name could be "Sanskriti Exp : Epar Bangla Opar Bangla"
New Delhi, 24 February : Indian Railway will launch a new train service linking West Bengal with Bangladesh to mark the 150th birth anniversary of Ravindranath Tagore in May next year. 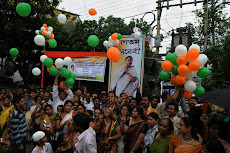 Indian railway minister Mamata Banerjee announced the launch of the special service across the Bangladesh-India border while presenting the rail-budget for 2010-2011 in the Lok Sabha, the Lower House of the India's Parliament, on Wednesday. 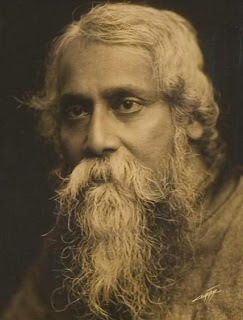 "Tagore is the only poet in the world whose poems have been adopted as National Anthems by two countries, Amar Sonar Bangla for Bangladesh and Jana Gana Mana for India. 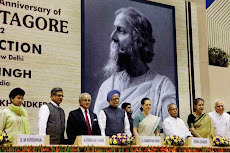 Tagore lived and produced many of his literary jewels in undivided Bengal," Banerjee told the House. 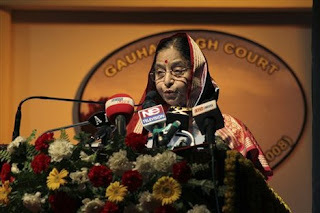 "In homage to this great savant and to strengthen the maitree (friendship) between Bangladesh and India, it is proposed to run a special train in consultation with the Government of Bangladesh across the border so that the two countries share the opportunity of celebrating his 150th birth anniversary jointly," she added. Officials of the Indian railway ministry said that the new train could be named the 'Sanskriti Express : Epar Bangla Opar Bangla". 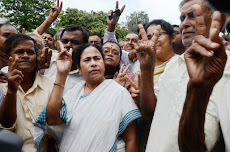 Kolkata, 24 February : West Bengal's ruling Left Front Wednesday denounced Mamata Banerjee's railway budget as a political gimmick with an eye on the state's assembly poll next year, saying 'it would take 2,500 years' to fulfil the promises that had been made. 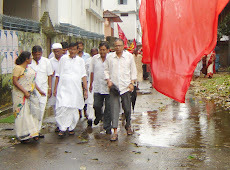 CPI(M) that leads the Left Front slammed the budget for making fake promises without allocating funds. 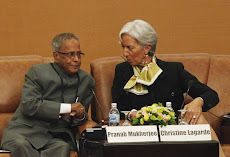 'The projects announced in the railway budget would take 2,500 years to become a reality. They don't have money and they have already announced that they will build hospitals, universities and run hundreds of new trains. Where will the funds come from ?' 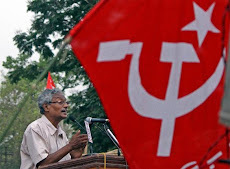 CPI(M) central committee member Shyamal Chakraborty asked. No hike in fares, 54 new trains in "Indian Railway Budget"
PTI, New Delhi, 24 February : The Indian Railway Budget for 2010-11 on Wednesday proposed no increase in passenger fares and freight rates while reducing the tariff by Rs 100 per wagon in transportation of foodgrains, kerosene and fertilisers to tackle the price rise. 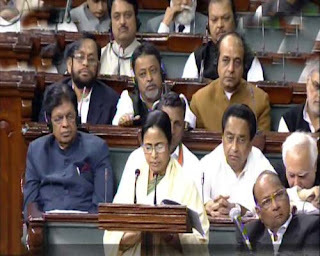 The budget, presented by Railway Minister Mamata Banerjee in the Lok Sabha, also proposed to reduce the maximum limit of service charge on e-booking of tickets to Rs 10 for sleeper class and Rs 20 for AC class. The present maximum charge is Rs 15 and Rs 40 respectively. This is the seventh year in a row that passenger fares have not been raised.Announcing a slew of concessions for passengers, Banerjee proposed free travel for cancer patients going for treatment in three-tier AC and sleeper class and continuance of concessions for students of madrassas and journalists. The minister said 101 new suburban services will be introduced in Mumbai and more services will be launched in Kolkata and Chennai. Special tourist trains called 'Bharat Teerth' will be started on 16 routes while six long-distance non-stop Duronto Express and four short-distance Duronto day trains will be introduced, the Railway Minister said. 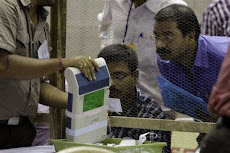 West Bengal Police's SIM card used to make Kishenji call ! 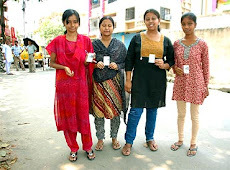 Kolkata, 24 February : A SIM card once belonging to a policeman was used by Maoist chief Kishenji's aide on Monday to call up media houses and offer a conditional 72- day ceasefire. 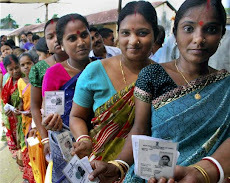 The police tracked the calls made on Kishenji's behalf by Raju and found that the SIM card owner was constable Shishir Kanti Nag who had been abducted by the rebels from Lalgarh last September. 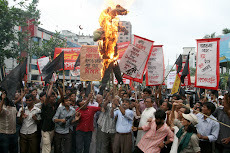 The Maoists had, in return, demanded the release of People's Committee Against Police Atrocities leader Chhatradhar Mahato. 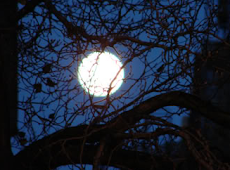 Nag was later released the night he was abducted. Dhaka, 24 February : Bangladesh Law Minister Shafique Ahmed on Wednesday said the government has taken all necessary logistic arrangement for starting the trial of 1971’s war crimes. The appointment of the investigators will be completed within March followed by the appointment of prosecutors, chairman and members of the tribunal, he said. He said this at a press briefing in the morning at the old High Court building where the tribunal will be set up. Shafique also expressed the hope that the trial would begin between March and April. 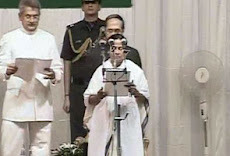 IANS, New Delhi, 24 February : Combative, hectoring and ploughing on regardless of the commotion around her, Railway Minister Mamata Banerjee was at her feisty best Wednesday when she presented the railway budget for a marathon two hours.Dressed in a white and green sari and her trademark rubber slippers, Banerjee presented her second budget speech in the Lok Sabha with a constant din from the opposition that attacked her for being pro-West Bengal. 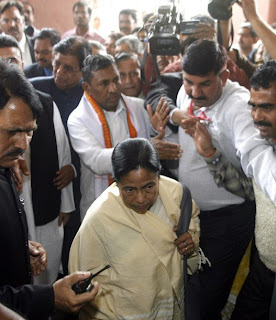 Port Blair, Kolkata, 24 February : After all struggles and fights in the Parliament, the lone Member of Parliament of A&N Islands was finally successful in making the Indian Railway Minister Mamta Banerjee commit for a railway line connecting Port Blair to Diglipur. 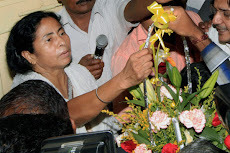 Mamata Banerjee while presenting the Railway Budget 2010-11 announced today that the Railway Line Project to connect Port Blair and Diglipur is under consideration. 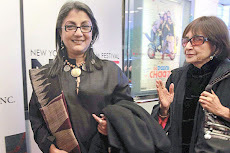 On getting the approval from the Planning Commission, it will be implemented, she said. 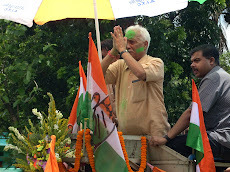 It was also recorded that Mamta Banerjee while making the announcement looked at the Shri Bishnu Pada Ray with a smile, who has been raising his voice in the Lok Sabha for the fulfillment of this demand. Agartala, 24 February : A banned cough syrup worth Rs 4 lakh has been seized from the cargo base of Agartala airport, officials said on Wednesday. "Acting on a tip-off, a team of police personnel conducted a search operation at cargo base of the airport last evening and seized 4000 bottles of cough syrup, phensidyle," Officer-in-Charge of Airport police station, S S Kar said. The bottles kept in 20 trunks were smuggled from New Delhi airport in a flight, he said. 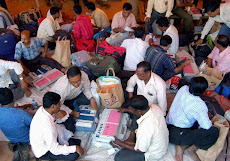 "Nobody claimed the consignment and the bottles were handed over to customs authorities," Kar said. No one was arrested in this connection, the police said. 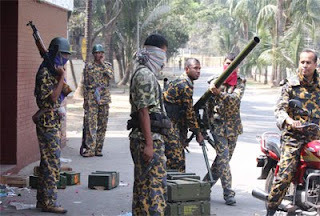 Dhaka, 24 February : The special court, formed to hold the trial of BDR Pilkhana carnage, on Wednesday adjourned the trial against 86 mutineers of Dhaka Sector Rifle headquarters till 15 April. The court is scheduled to resume at 9:00am(BDST) on 15 April to hold hearing on the charge framing in the BDR mutiny case. Major Matiur Rahman, prosecutor in the case and officer-in-charge of Dhaka Sector Rifle, informed the court about the allegations brought against the BDR personnel. He said according to the BDR Act, the accused were involved in mutiny and they should be tried as per the act. 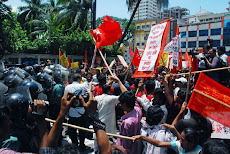 The court asked the prosecutor to produce all the accused before the court on 15 April. The court also asked the prosecutor to publish advertisement in newspaper within seven days asking the accused to surrender before it. 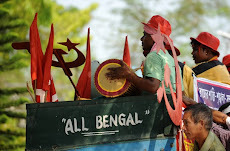 Jhargam, 24 February : Maoists backed People’s Committee Against Police Atrocities (PCPA) has called for a weeklong strike across West Bengal starting from Wednesday to protest against the killing of their top leader in an encounter. On Tuesday, the PCPA leader Lalmohan Tudu was shot dead during a so-called encounter with security forces in trouble hit Lalgarh area. According to police, Tudu was killed while leading an attack on a camp of the security forces in Kantapahari. But the PCPA claims that the forces killed him near his house. 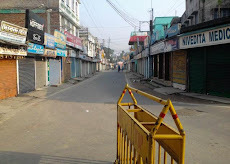 Shops and other business establishments in Maoists dominated areas were closed and public transport also remained off road today. 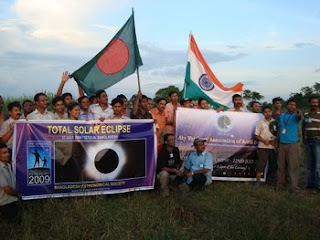 New Age, Noakhali, 24 February : Solar power has brought about a change in the lifestyle of char people in three upazilas of Noakhali, Bangladesh providing them with a little touch of modern world. The char people, who had never thought of power supply in their areas, now switch on lights to remove darkness from their houses and watch TV thanks to solar power. Some 3,800 solar power connections have so far been provided to nine villages in three upazilas by a Grameen Bank project named Grameen Shakti, according to project official sources. About 4,200 households and shops are benefiting from solar power by taking parallel connections, the sources said. PTI, Shillong, 24 February : Meghalaya Chief Minister D D Lapang will lead a 14-member delegation tomorrow to Dhaka, where he is expected to meet Bangladesh premier Sheikh Hasina and raise the issue of North east militants taking shelter in that country. Lapang, who will be accompanied by his two deputies Mukul Sangma and B M Lanong, besides top government officials, will also discuss a host of issues ranging from improvement of connectivity and cooperation in tourism, health care and education with Hasina and Bangladesh foreign and industry ministers during the four-day visit, his advisor Anish Gandhi told PTI. 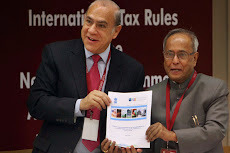 "We will be attending the international trade fair organised by India Bangladesh Chambers of Commerce and Industry. 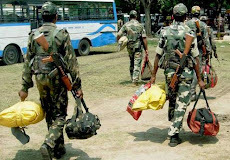 Khagrachhari, 24 February : Joint forces members during the overnight 10-hour curfew arrested 70 people, including 42 indigenous and 28 Bangalee settlers, from Khagrachhari district town and its adjacent areas in connection with Tuesday’s violence that left a Bangalee settler dead. Khagrachhari Municipality Councillor Abdur Rab Raza was among the arrested, reports our Khagrachhari correspondent. The curfew, which was imposed Tuesday night following the eruption of fresh clashes between Bangalee settlers and indigenous people, withdrawn at about 7:00am(BDST). 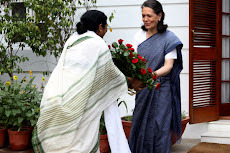 New Delhi, Kolkata, 23 February : Indian Home Minister P Chidambaram Tuesday said "no ifs, no buts" to the Maoists' inclination for dialogue and gave out a facsimile number for talks. 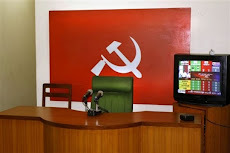 Maoists responded by giving a cell phone number (+91 9734695789) to Bengal Newz and other media on which the central government could contact them. 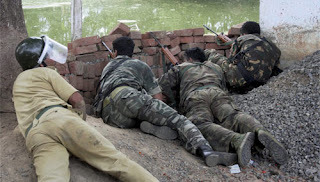 However, just after Maoist leader Kishenji offered a 72-day conditional ceasefire to the government Monday night, armed Maoists attacked a camp housing security personnel in West Midnapore district late in the night. Responding to reports that the Maoists were ready for a truce, Home Minister P Chidambaram said the government will respond "promptly" if Maoists made a formal and unconditional offer to stop fighting and talk. PTI, Port Blair, 23 February : Director general of Coast Guard, vice-admiral Anil Chopra would visit Andaman and Nicobar islands tomorrow to take stock of the measures to strengthen coastal security in the region. During the four-day visit, vice-admiral Chopra will assess the operational preparedness and take stock of the measures taken up to strengthen coastal security in the region after Mumbai terrorist attack, a Coast Guard release said here today. 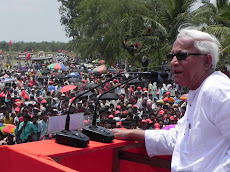 He will also visit the new Coast Guard station at Diglipur in Hut Bay to see the ground situation in these far-flung and strategically important locations, it said. Orphan elephant cubs wait for food before the start of their training inside an elephant training school at Malongi in Jaldapara Wildlife Sanctuary, about 160 km north of the Siliguri. 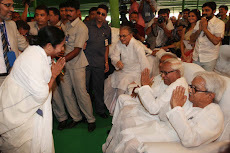 Kolkata, 23 February : West Bengal Governor M K Narayanan is understood to have received a first-hand account of the government's stand on tackling Maoists and the situation in Maoist-hit areas during a meeting this evening with Chief Minister Buddhadeb Bhattacharjee. 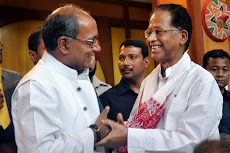 Narayanan, a former National Security Advisor, held talks with the chief minister on the Maoist menace, official sources said. The meeting came within hours of Union Home Minister P Chidambaram making it clear that it would not accept any pre-conditions for talks with Maoists. 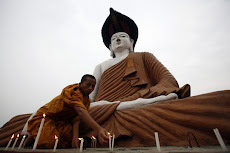 Dhaka, 23 February : Bangladesh and India have agreed to lay a cross-border power cable to light up Dahagram and Angarpota, the Bangladeshi enclaves in Indian territory. 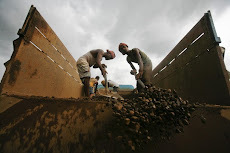 The agreement was reached at a district magistrate-level meeting between the two countries near the Tin Bigha Corridor inside India at the initiative of the Indian government. 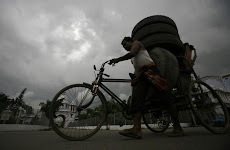 The underground electric cable will be laid through the Tin Bigha Corridor from 1 March, according to BSS, the official news agency of Bangladesh. 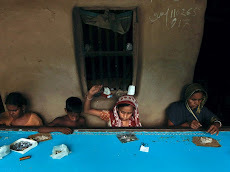 Dahagram and Angarpota in Lalmonirhat district are Bangladeshi enclaves that are connected with the rest of Bangladesh through the Tin Bigha Corridor, a tiny area leased by Bangladesh but controlled by India. 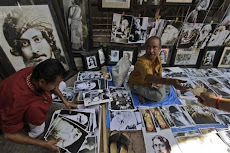 The corridor, located in India's Cooch Behar district, is open daily during day, but only every second hour. The power pact is part of the initiative taken by the neighbours in the wake of the India visit last month of Prime Minister Sheikh Hasina. 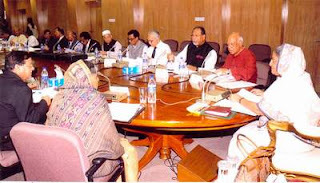 A private business firm of Bangladesh will set up the cable network, and complete the work by 16 March. 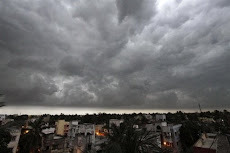 Agartala, 23 February : The National Rainfed Area Authority (NRAA) has launched a pilot project in six states of high rainfall receiving zone, including Tripura, to ensure holistic development of the regions. 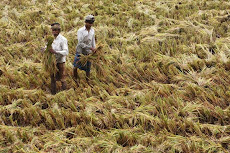 Official sources here said NRAA had launched pilot study in Chattisgarh, Gujarat, Maharashtra, Tamil Nadu, Tripura and Uttarakhand for rainfed forest development and promote income generation activities through forestry. 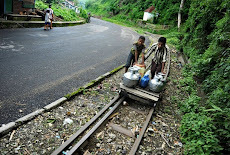 In the interest of addressing problem of sustainable food security, drinking water and all inclusive development in the rainfed area of the country, NRAA has sanctioned Rs 4.54 crore to Tripura. 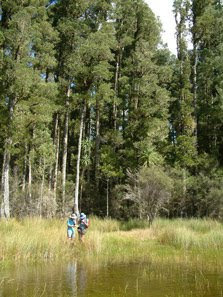 The pilot project envisages treatment of 6544.0 hectares land, including 2584 hectares forest and 2778 hectares agricultural area, in three forest divisions of Tripura aiming to optimise management of fringe forests and adjoining non-forest land for integrated and holistic management of natural resources. 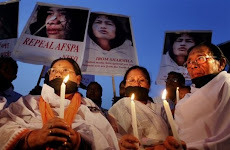 Guwahati, 23 February : A special anti-terror court on Tuesday released on bail two top separatist leaders of the outlawed United Liberation Front of Asom (ULFA), a move seen as an attempt by the government to help push the rebels towards peace talks. Vice chairman Pradip Gogoi and publicity secretary Mithinga Daimary were given bail by the special TADA (Terrorist and Disruptive Activities (preventive) Act) court here. The government prosecutor did not oppose the bail petitions. The public prosecutor did not oppose the bail applications of both the ULFA leaders and hence the court decided to release them on bail. New Delhi, 23 February : Bangladeshi shooters Sharmin Akhter Ratna and Sadia Sultana clinched gold medal in women's 10m air rifle pair event of the Commonwealth Shooting Championship at the Dr Karni Singh Shooting Range in New Delhi on Tuesday. The duo, earlier this month brought glory for the country by winning the South Asian Games 10m air rifle team gold and Ratna won the individual gold of the same event. 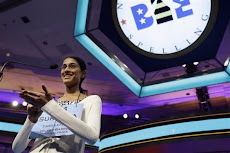 Ratna (396) and Sadia (394) together scored 790 to put Indian pair Priya Aggarwal (393) and Neha Sapta (389), who together made 782 to be content with silver medal. Meanwhile, Bangladesh's Asif Hossain Khan and Shovon Chowdhury had earlier won bronze medal in the men's 10m air rifle pair event in the competition. 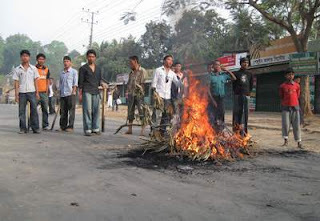 Khagrachhari, 23 February : An eruption of fresh violence forced the authorities to roll out army in Khagrachhari where at least 40 people were injured and 50 houses burnt in clashes between indigenous people and Bangalee settlers on Tuesday. Indigenous people set fire to at least 32 houses of Bangalee settlers in Masterpara, Narikel Bagan, Upazila parishad and Sena Kalyan areas in retaliation of the attacks on them. 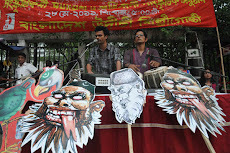 Bangalee settlers had allegedly torched 19 houses of indigenous people in Mahajanpara and Chengi Square areas. Twenty vehicles were also vandalised during the clashes in the district headquarters. 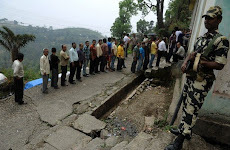 Siliguri, 23 February : The Central Reserved Police Force (CRPF) arrived at Siliguri to control the violent atmosphere prevailing in Darjeeling, Kurseong, Kalimpong and Terai regions for the past few months over the demand for a separate Gorkhaland. The activists of regional Gorkha Janamukti Morcha (GJM) and the Vidyarthi Morcha (Students’ Front), have continued their agitation and in the process burnt up many police booths, observed strikes and destroyed houses of innocent people residing in hills and Terai regions. 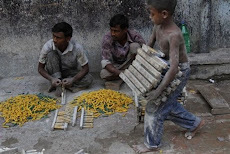 The central government has sent three companies of paramilitary forces to be deployed in these regions. 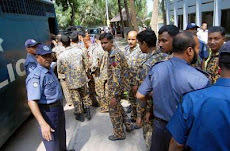 Dhaka, 23 February : The trial of 86 alleged mutineers of Dhaka sector headquarters of Bangladesh Rifles began on Tuesday at Pilkhana Darbar Hall, where the 33-hour mayhem set in last year. 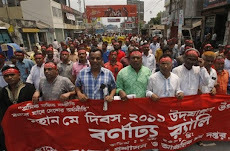 On the opening day of the first mutiny trial to be held in the capital, the Special Court-5 of the BDR issued arrest warrants against the two absconding mutineers. 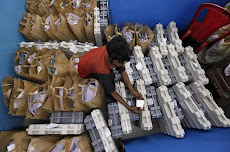 It also asked the authorities to show arrested 65 BDR men continuing their job at the Pilkhana headquarters till date and produce 64 of them before it on Wednesday as one of them is under going treatment at BDR hospital. Nineteen other BDR personnel, who remain in detention, will also be produced before the court on the same day. PTI, Guwahati, 23 February : A militant of the NDFB (Daimary) faction was killed in an encounter with security forces in lower Assam's Kokrajhar district today. 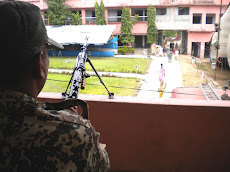 The extremist, belonging to the anti-peace talk Ranjan Daimary group, along with two others exchanged fire with the security forces at Howraguri Narayanpur, official sources said. In the encounter, the militant was killed. An AK-56 assault rifle with five bullets and two magazines were recovered from the slain ultra. Two other NDFB insurgents fled from the spot.